I am in love with that monkey! I really want to do a post on food art- these are so cute! And perfect for "This is why you're thin!" I love the black (well, green actually) sheep of the bunch!! Has anyone tried to make these themselves?? I was looking for food themed artwork to decorate my kitchen with for the past 5 years since I finished my kitchen remodel. Every single one of them that I found so far were too commonplace - like shots of veggies and pasta and dishes. I never liked any. 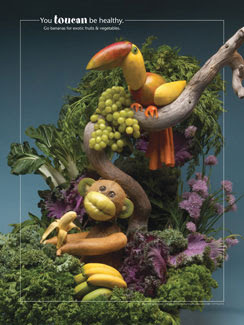 But, looking at all the posters on Foodscapes, it is hard to choose because I like them all. How creative and attractive!! I will ask my toddler to choose a few of his liking and put them up on my kitchen walls. Thanks a lot jennifer for pointing me in the right direction again. Heeheehee! I love this stuff. 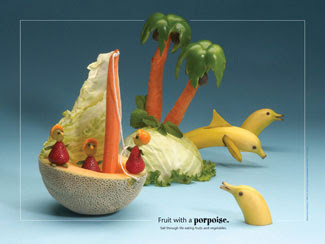 I used to have a calendar of food scapes and it made me chuckle every day. It really makes you look at your fruits and veggies differently. I have two calendars of food scapes. I love them! I work at a library and have actually seen books full of these pictures -I think by the same artist. They're called food fight, fast food, and there are a few other titles aslo. Adorable is all I can say. Yes, even fruits and veggies can merit an "adorable." THOSE ARE TOO CUTE! I love the clever little saying on each of them. I LOVE them!!!! So cute!!! Too cute! Thanks for sharing the link! By the way, what happened with pre-teen shmoo? I haven't seen one of his lunches since January! >>By the way, what happened with pre-teen shmoo? Oh, he's fine, he's just busy being a preteen. Friends, Legos, and Harry Potter are his necessities, and you never know if he'll decide he needs to eat as well. If he lets me pack him a lunch sometime, I'll be sure to let you know! I love the dolphin! Those are adorable. That's so funny ! I'm lovin' your blog. I’ve actually found a vegan delivery service, it’s in CA but you might want to check it out. It’s called Vegin’ Out. I love those foodscapes. I sent the site to my mom. She's a cook at a small middle school and is sometimes looking for prizes for the students. The posters would look great in the cafeteria and the students would like the stickers and temporary tattoos. Thanks for sharing the site! Have you seen their book? Very cool kids book with vocabulary, opposites, and counting sections--they keep my kids very entertained! 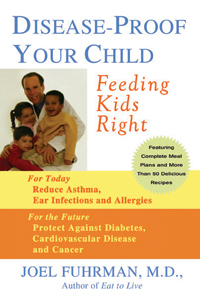 Plus kids can learn about a ton of different unusual fruits and vegetables you don't see in most books. 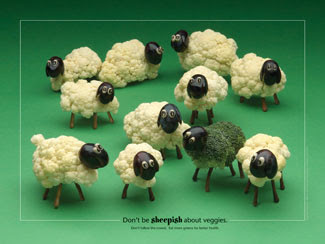 I'm a broccoli sheep..for sure! Love the post..really cool! Oh my gosh these are adorable! I might just have to order some and put them up in my school. That would a nice break from all the "got milk?" posters! Thanks Jennifer! Wow!! the idea is brilliant, personally I like , but it will be interesting to see something like human model from inside: broccoli looks so similar to lungs and red paprika or tomato can take place of the heart…?